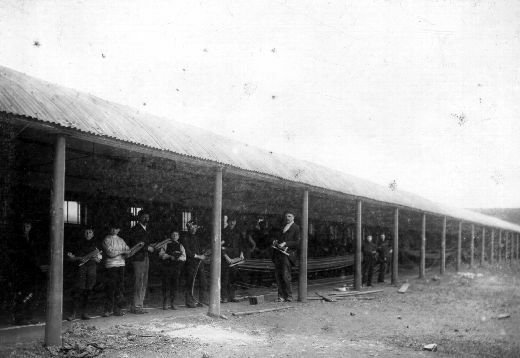 Black and white photograph of workers at Calvert Bros. Ropery on Jerry Clay Lane Wrenthorpe c.1900. The image shows six men and four young boys holding rope making tools. Calvert's Ropery was founded c.1787 and ceased manufacturing rope and twine from jute in 1962. Calvert's rope works at Jerry Clay Lane, Wrenthorpe. The business started before 1787 and closed in 1962.